The Alliance is pleased to announce its Annual Meeting and Leadership Conference will be held April 11, at Delta Hotels by Marriott Minneapolis Northeast. The event, with the theme “Up Your Game,” offers a line-up of seminars that are tailor made for auto service and collision repair shop owners and managers and presented by some of the industry’s top trainers. In addition to the impressive agenda of educational programming, there will be ample opportunity for attendees to network and socialize with their peers and industry vendors as they showcase new products and services during happy hour. For registration information, visit the AASP-MN website, www.aaspmn.org or contact the AASP-MN office at 612-623-1110. AASP-MN is an association of independently-owned automotive service businesses and industry suppliers dedicated to improving Minnesota’s automotive service industry and the success of its nearly 800 members. For more information, visit www.aaspmn.org. The Alliance of Automotive Service Providers (AASP) has elected its Executive Committee for 2019-2020. The election was held at AASP’s board of directors meeting on October 31, 2018, in Las Vegas, Nevada. The Alliance of Automotive Service Providers is a coalition of associations which serve over 8,500 members of the automotive service industry. In a spirit of mutual cooperation and support, Alliance participants are committed to sharing information, knowledge and other resources for the benefit of the members they serve. Raleigh, NC—The Independent Garage Owners of North Carolina are once again hosting ASTE (Automotive Service & Technology Expo) September 27-28, 2019 in Cary, NC at the Embassy Suites and Convention Center. Repair shop owners, service advisors & technicians will be able to take part in the largest automotive aftermarket event held in the Carolinas. This event has some of the nation’s top trainers delivering cutting edge information at a price that one would expect to pay for just one seminar. Cary, North Carolina is centrally located and easily accessible from anywhere in the region. There are plenty of restaurants and shopping in the surrounding area, as well as the beautiful Umstead Park. MNCARS – Minnesota Careers in Auto Repair and Service – is pleased to announce the launch of its Motormouth™ campaign. All automotive professionals across Minnesota are invited to join the movement to promote auto service and collision repair careers and fill the pipeline of future employees by being a Motormouth for the industry! 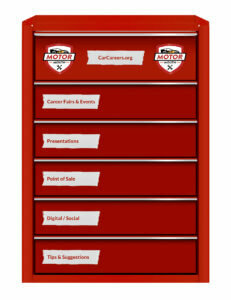 And MNCARS has created a fully stocked toolbox (www.carcareers.org/motor-mouth/) of information to help them get started. The Motormouth toolbox contains a variety of resources, tips and materials to help industry members get involved in their local community and start having conversations with customers, community members and students about the career potential in the automotive industry. All members of the automotive service industry are encouraged to seek out events and speaking opportunities in their local schools, chambers of commerce, car clubs and other community organizations. The toolbox has all of the materials Motormouths will need to spread the message about the important opportunities and roles within the automotive industry and ensure that repairers have the talented employees they need to succeed. MNCARS was established in 2016 by the Alliance of Automotive Service Providers of Minnesota (AASP-MN) to raise awareness of career opportunities in the auto service and collision repair industry and to recruit students into college automotive education programs and industry jobs. The initiative has reached thousands of potential students, parents and counselors through its website, social media, event participation and presentations to middle and high school classes. Visit www.carcareers.org to learn more. The Alliance of Automotive Service Providers of Minnesota (AASP-MN) is pleased to announce scholarship awards totaling nearly $16,000 to help automotive service and collision repair students pay for tuition and tools during the 2018-19 school year. The scholarships are in the amount of $1,000 per student and were made possible by a successful fundraising drive within the AASP-MN membership, as well as generous donations from the Minnesota State I-CAR Committee and the Bill Smith Fund. Thirty-seven college and high school students from 14 schools submitted scholarship applications. Applications were reviewed by a committee of industry representatives, with consideration given to scholastic achievement, education and career goals, financial need and written recommendations. Congratulations to all of this year’s recipients! The scholarship awards are the centerpiece of AASP-MN’s Automotive Education Fund, which was established to provide financial resources to support automotive students, enhance automotive programs and raise awareness of career opportunities in the independent automotive service industry. The Alliance of Automotive Service Providers of Minnesota (AASP-MN) is an association of nearly 800 independently-owned automotive service businesses and industry suppliers dedicated to improving the state’s automotive service industry and the success of its members. The MNCARS initiative is made possible by the generous contributions of industry organizations and companies. Check out www.carcareers.org and visit the About Us page to see a list of sponsors and supporters. Those who are interested in contributing by volunteering their time or financial support should contact the AASP-MN office at 612-623-1110 or judell@aaspmn.org.